Having participated in the online registration process for MP High Court Recruitment 2017, applicants are asking for the MP High Court Admit Card 2017 because they are going to participate in the approaching preliminary examination of this recruitment. This test is anticipated to be held on 23rd July 2017 (30th July 2017). So, the contenders are willingly waiting for the admit card because they know that if they don’t download the admit card then they will not be able to take part in the test. Such aspirants don’t want to lose this chance. Hence, they are here now in the search of their hall tickets. So, candidates go below to get the details of your admit card. For any type of examination, admit card becomes the most important document for the students. That is why, we have written this article for those readers who have applied for this job notification which was issued for the recruitment of suitable job seekers on 2910 vacancies of the stenographer (grade 2/3), assistant grade 3 and stenographer in the organization. Many contenders have registered for these posts and at present, they have only one thing in their mind which the preliminary examination. To clear their all queries we have given the significant details on this web page about this recruitment test. Fresh Update: MPHC Asst Grade 3 Exam will now take place on 30.07.2017. Admit Cards can be downloaded using the direct link which is accessible at the last of this page. The hall tickets of this examination are released by the MP Online on its website. Aspirants will have to take the printout of the Madhya Pradesh High Court Stenographer Hall Ticket 2017. The information of this admit card is provided on the website of the MP High Court. To download the hall ticket, contenders will have to enter their application number and date of birth. The main link to download the hall ticket will also be given at the last of this page after the releasing of admit cards. Authority will conduct this test on 23-07-2017 30th July 2017(Sunday) (This is new date). On this day, the exam will be held at 2.00 PM to 4.00 PM. If the quantity of applicants will be large then authority may conduct this test in various shifts. Candidates have not to be worried about this because the correct timing will be given on their admit card. The examination will be conducted for all vacancies which are the stenographer, assistant grade 3 etc. Currently, all applicants are in the search of MP High Court Prelims Admit Card 2017. We inform to those candidates that this test will be conducted in the online mode and the exam will be of total 100 marks. There will be total 100 questions in this examination which will be organized as MCQs (4 options). Questions in this examination will be asked from five subjects respectively GK & Social Science, Maths & Science, General Hindi, English Knowledge, and computer Knowledge. So, candidates must prepare for these subjects to crack the examination. Preparation in not sufficient to get the success in the examination rather you are required to have the MP High Court Admit Card 2017 before the examination otherwise you will be restricted to sit in the examination. Following are few instructions for you which are given in the official notification of this examination. The exam would be of 120 minutes (two hours). There will not be the negative marking in this examination. To introduce the applicants about the process of this examination, the organization will provide the facility of mock test on mponline.gov.in. On the date of examination, candidates will have to bring a photo included ID (original) with their admit card. Xerox copy of the ID will not be allowed in the exam. Before starting the test, applicants will have to enter their application number in the box of User ID and in the place of the password, they will have to enter their date of birth. Afterward, the contender has to choose his/her answer and save the same answer. Applicants can carry only hall ticket, Photo ID and Pen/Pencil in the examination center. Mobile, calculator and other things are not allowed in the exam. Bio-matric registration of the aspirants will be done at the exam center. Further instructions about this examination will be given on the main website by MP Online. 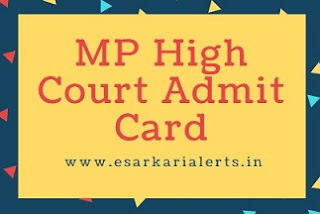 For the latest status of MP High Court Admit Card 2017, applicants are required to keep in touch with this web page. Direct link to download the hall ticket is given below.